4K Blu-ray discs look set to be made official | What Hi-Fi? It looks like we are going to see 4K Blu-ray discs. Information surrounding the next generation of the Blu-ray format appears to have leaked, pointing towards the possibility of discs able to store up to 100GB, necessary for Ultra HD films. We knew that Panasonic and Sony were working on developing a new, bigger capacity Blu-ray disc, but reports suggested that manufacturers were not looking to release these high-capacity optical discs to the public. Now, a press release on the Singulus Technologies' website (spotted by HDTV Test) – a company which builds machines used in the manufacture of optical discs – seems to reveal exactly that. 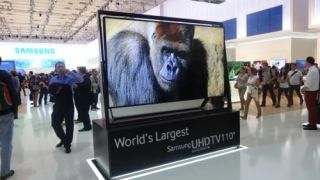 With more 4K TVs being released at IFA 2013, film studios – Sony in particular – have been readying more content, notably its 4K streaming service in the US. Now it seems we may get 4K Ultra HD discs, too. Reports suggest that the triple layer discs (33GB on one layer, up from 25GB) will be able to comfortably store a 4K film although, despite the breakthrough, it's still as yet unclear how this will work with regards to 4K playback on current Blu-ray players.